The Sepilok Nature Resort is a simple resort of air-conditioned cabins connected by a wooden boardwalk around a pond, right next to the orangutan sanctuary. When I arrived, my room was not ready so I gathered my camera bag and handbag and set off to the sanctuary next door. Fortunately the guide who met me at the airport was headed there for lunch and dropped me in plenty of time for the 3 pm feeding, saving me a short walk in the hot sun. There is a charge of RM 30 plus RM 10 for my camera. 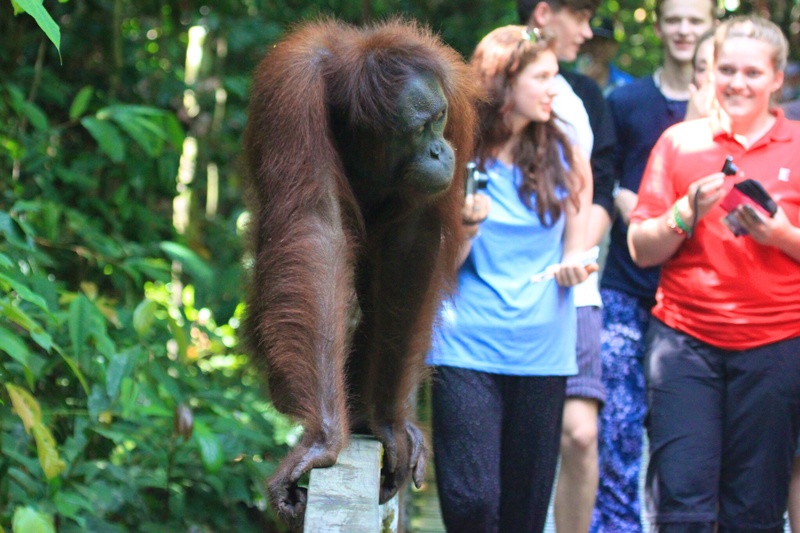 After stowing my bags in a locker, as you are not allowed to take any bags in with you as they might be stolen by mischievous orangutans, I headed onto the boardwalk towards the feeding platform. After Semmengoh, my expectations were low, and I would not have been surprised if once again there were no apes to be seen. This time there was no detailed ranger briefing, just a friendly ticket inspector who admired my camera before sending me down towards the platform. I suspect he was checking I should not be counted as a professional photographer and therefore charged a fortune for admitting my camera. The rather blunt instrument they use for determining if a person is a professional photographer is apparently by the size of the telephoto lens. 500 mm and above is deemed to be professional, and the charge for the camera goes up to RM 10,000! Fortunately mine is 400 mm. 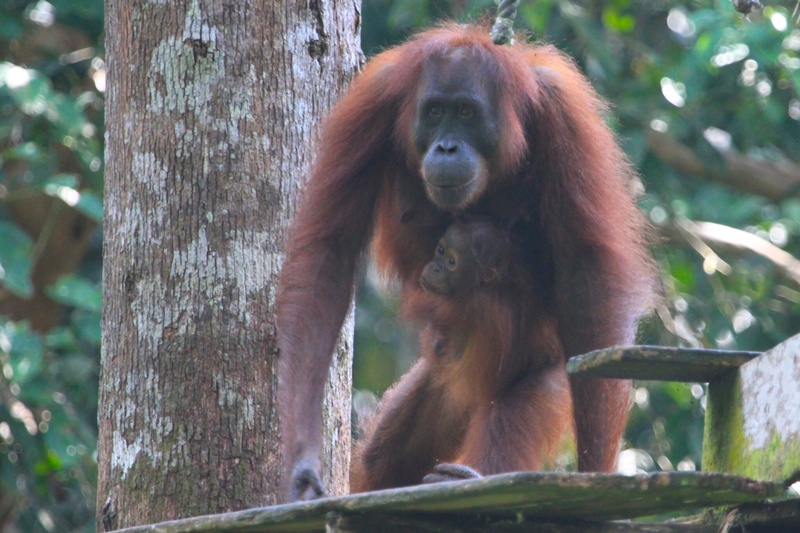 I had not gone far along the boardwalk before I saw an orangutan mother and baby high in the canopy. 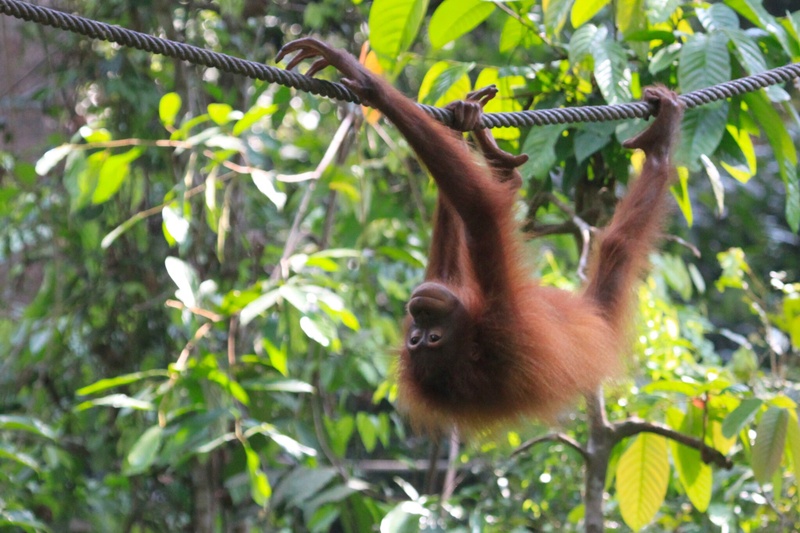 As I watched her, I heard muffled excitement and turned to see an orangutan heading along the hand railing next to the boardwalk right towards me. I snapped a picture before backing up, but he moved too fast, so I flattened myself against the far railing to let him pass. I followed him towards the feeding platform and took one of the last slots at the front of the viewing platform, next to a man wielding two expensive cameras. A Dutch couple came and asked if their little kids could stand in front of us. The serious photographer refused, but I could not be so rude. To be fair to the parents, they did tell their kids to stop jostling me when the apes arrived. I would have liked to be able to kneel and use the railing as a tripod, but it was probably too crowded to do so anyway. It is tough for kids in an environment like that, as it is very hot and they have to stay quiet and still. As we stood in the hot sun, one young male arrived at the platform. He struck a very human pose, leaning against a tree with his arms folded. Then he grabbed a rope and leaned out hips first from the platform, which made for some rather X-rated photos, but at one point he looked right at me, so I focused on his face. He showed clearly it is not just humans that suffer from male pattern baldness, and just look at the intelligence in his gaze. Silence was not maintained at all, as a series of oohs and aahs greeted the arrival of a mother with a young baby. Despite the signs asking for silence, some people made a lot of noise. The mother scrambled along the rope to the platform and then hung there, eating bananas. 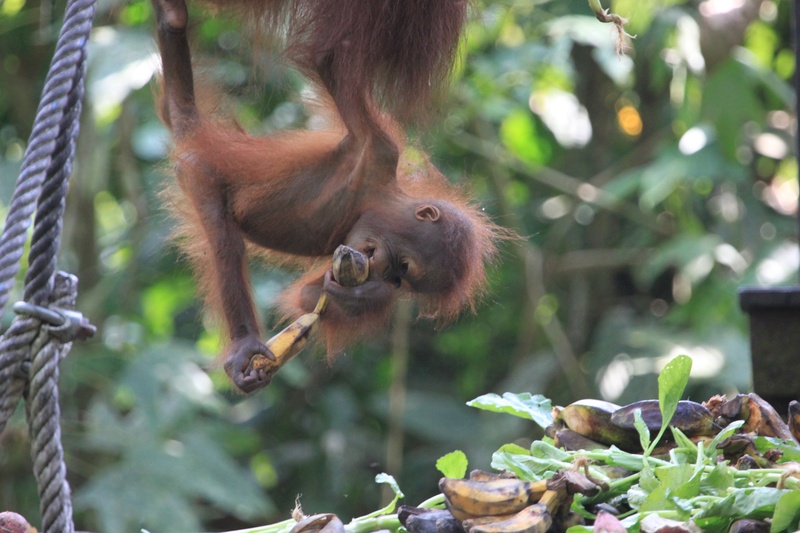 After a while, the baby emerged from where she had been tucked firmly against her mother, one hand still clinging to her mother as she tried to eat some fruit. 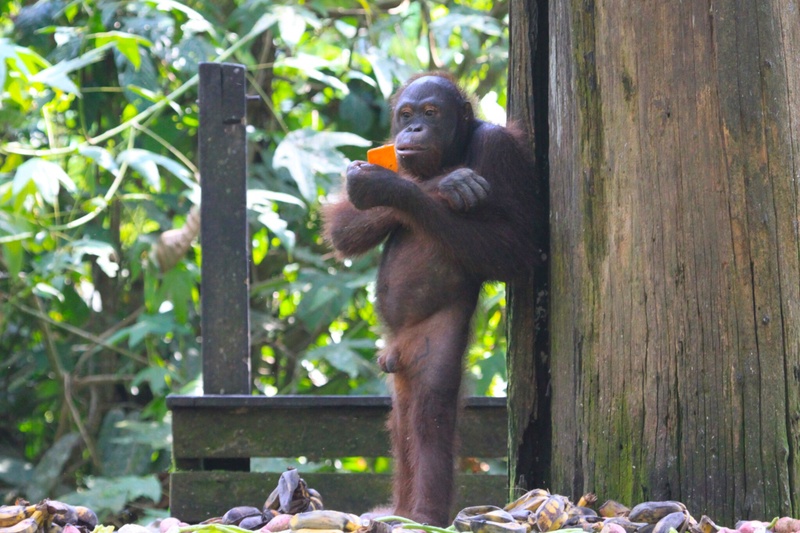 More orangutans appeared until there were five plus the baby, while the ranger who supplied the fruit sat unmoving on the platform with them. 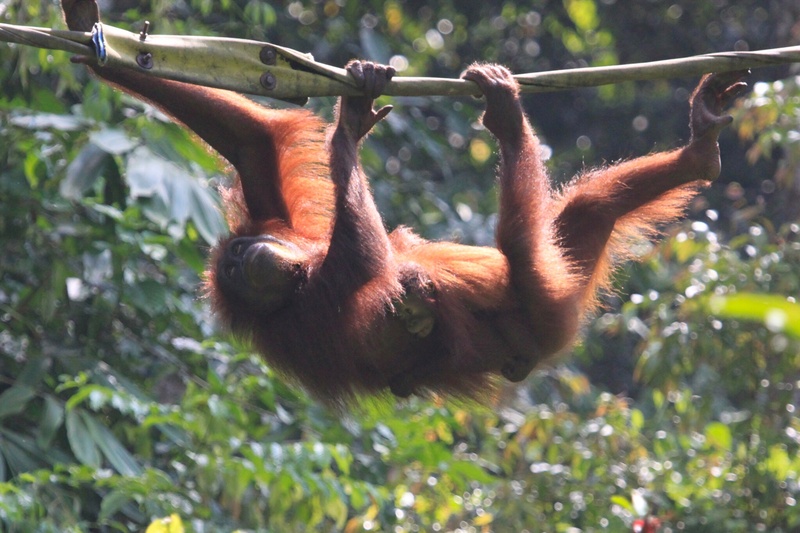 I fired off over a hundred photos until after about half an hour the orangutans took to the ropes one by one and headed back into the jungle. 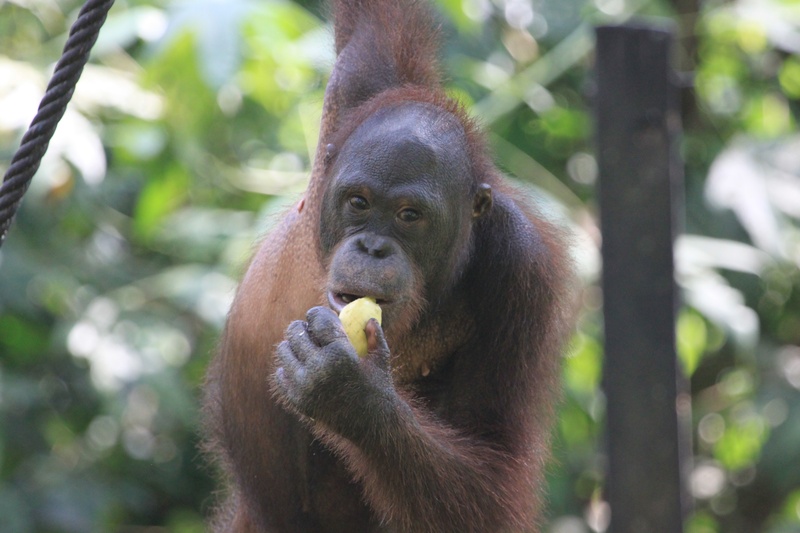 I had seen my first orangutans in Borneo. Hopefully I would also get a chance to see some in the wild in the coming days. Adjoining the orangutan sanctuary is a sun bear sanctuary. A few days before, one of the bears escaped and remained at large and in the vicinity. 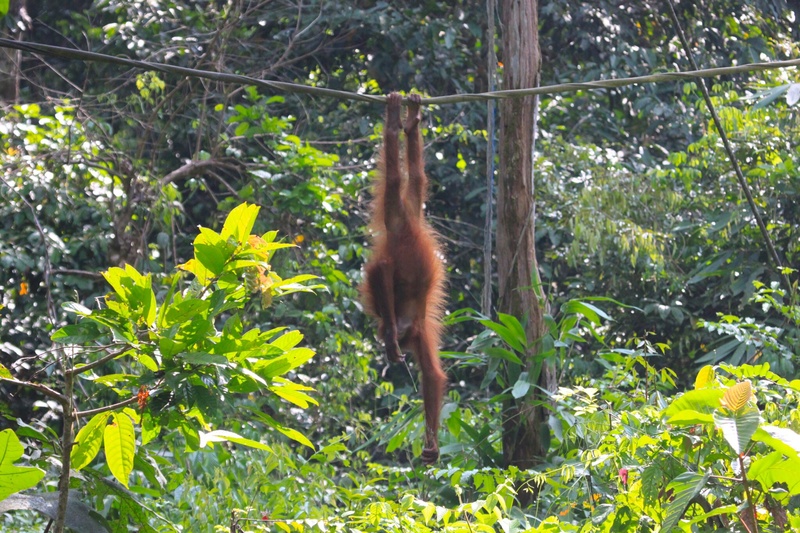 As a result, the trails in the orangutan sanctuary were closed to the public. I collected my things and headed back to the adjoining resort, as there was nothing further to be seen. That evening I had a night walk which was supposed to be in the grounds of the orangutan sanctuary, but which was moved as a result of the fugitive sun bear. I was collected by a guide and driven about fifteen minutes away to a construction site where the tour company is building a new resort. We waited with about four other small groups for night to fall. 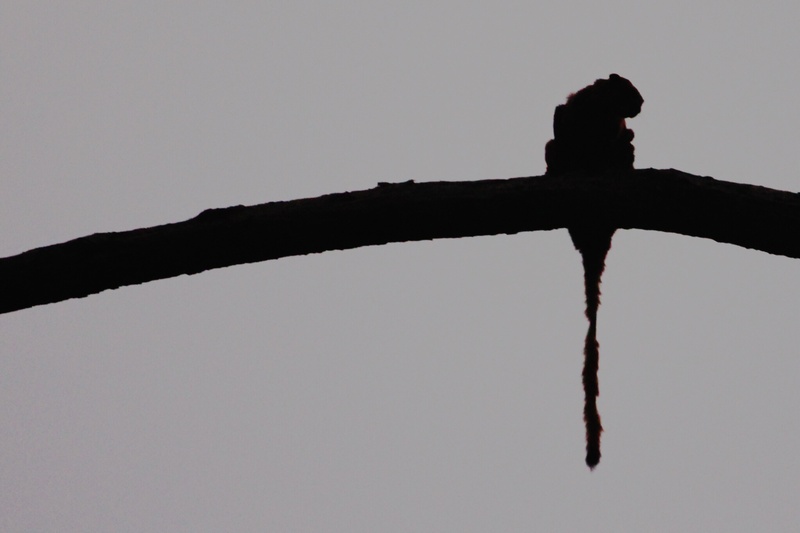 At dusk, a flying squirrel appeared in the tall canopy above us. I had taken a monopod in an attempt to get decent photos in the dusk, but despite my best efforts at steadying my lens, it was too dark and all my shots are fuzzy other than one silhouette. It was a magnificent sight, though, at one stage flying straight towards us. We watched it glide at least four times between trees. It would climb to get some height and then launch itself off a branch, gliding to the trunk of another tree in a flash of bright red fur. We then proceeded down to the nearly complete boardwalk. It had no side railings, and we had to access it via a narrow plank, but once on there, it was solid and we saw an agamid lizard and lots of large spiders. We could hear lots of frogs calling, and the guides got very excited when they heard the distinctive honk of a horn frog. 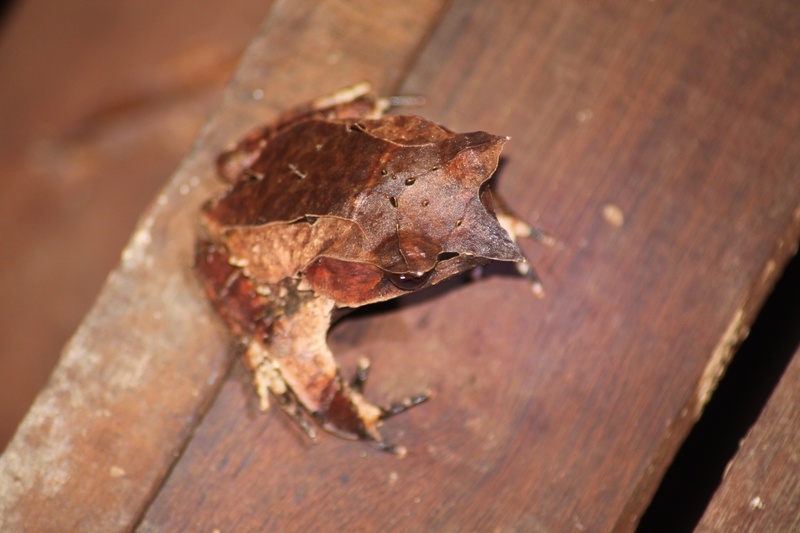 The torches caught is eyes, and we were able to photograph this lovely frog which looks just like a dead leaf. 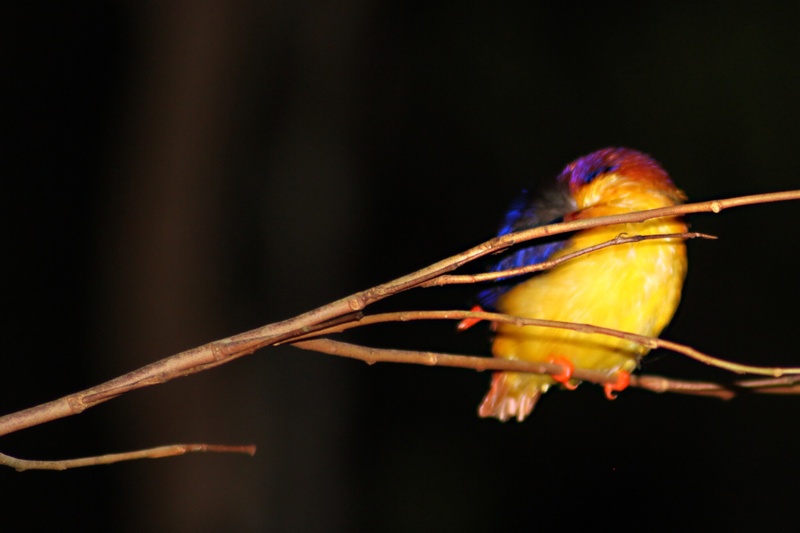 Our final spot of the night was a tiny, technicolour kingfisher fast asleep on a branch, with its head tucked firmly under its wing. After that, it was another scramble over the plank and back to the resort for the night before departing the following morning towards Lahad Datu. 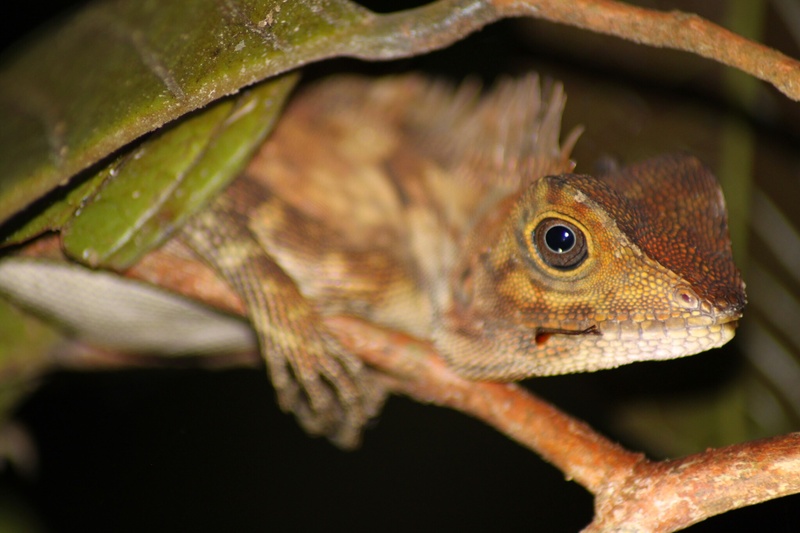 This entry was posted in Malaysian Borneo and tagged agamid lizard, flying squirrel, Horn frog, orangutans, Sepilok nature resort, Sepilok orangutan sanctuary on 14/08/2014 by paulaclarke.